It’s been about two weeks since my last post, and I’m clearly far behind real life events. So in the interest of catching up, I’m going to break down the last few weeks in a different way, using just the links and Tweets that I’ve been collecting. If I have time, I’ll go back into these posts and add my own photographs. Generally, the last two weeks have been very calm and peaceful. Yes, there are the occasional loud arguments and bursts of shoving (mostly in Mong Kok), but the protests have reached a sort of rhythm. They’ve become another way of life in Hong Kong. Ever since the student-government talks were held on October 21, the 24th day of the movement, there’s been a lot of rumors and a lot of standstill. Most of the rumors said that the Hong Kong Federation of Students would be sending a delegation to Beijing during the Asia Pacific Economic Cooperation forum this month. However, that’s turned out not to be the case at all, and so the city has been left waiting. My description of this Souvenir Era is not at all to discredit what the demonstrators are doing. One of the reasons I find this demonstration to be a Movement, rather than a Revolution in the strict political sense it typically connotes, is that there is a significant cultural shift happening. And the souvenirs are a way of sharing art with a wider crowd. Maybe you can’t stay the night in Mong Kok, but you can wait in line for an hour to get your t-shirt stamped with an original Umbrella Movement print. But the mood now is getting tense again, now that APEC is over and most of the international leaders, like Obama, have left China. The High Court injunction has also become a more pressing issue. There were rumors last night that the police would take down barricades today in order to enforce the injunction, but other rumors say that police action is more likely to happen next week. This is because the Shanghai and Hong Kong stock markets are due to connect on November 17. I’m not an economics or stocks person, but the Investor Education Center here has a few helpful words. 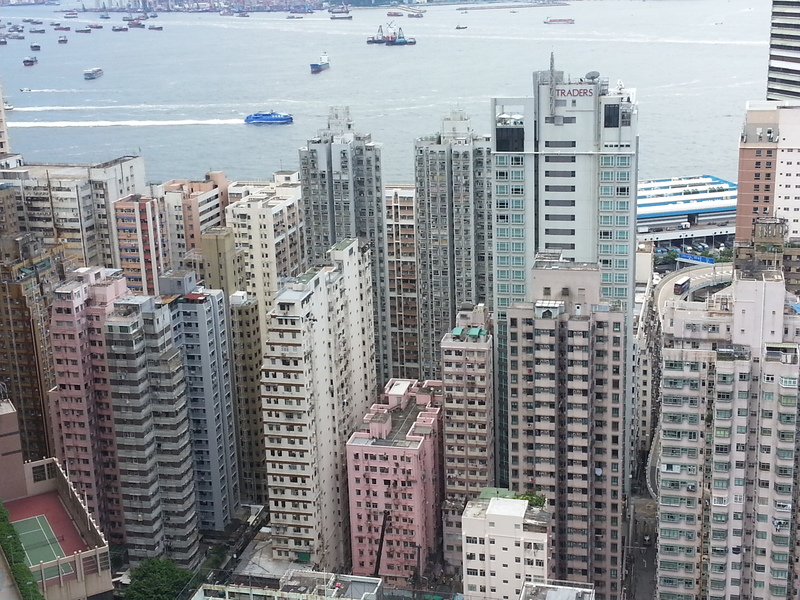 This new cross-border investment channel brought by the Shanghai-Hong Kong Stock Connect will enable investors in Hong Kong and the Mainland to trade a specified range of listed stocks in each other’s market through their respective local securities companies, thereby helping to promote and strengthen the connection between Hong Kong and the Mainland capital markets. At present, individual investors, in Hong Kong or from overseas, can only participate indirectly in the Mainland’s securities markets through certain investment products […]. In future, after the launch of Shanghai-Hong Kong Stock Connect, not only these investment products will be made available to Hong Kong and overseas individual investors, they will also be able to trade eligible Shanghai-listed A-shares directly. Under this programme, Mainland investors (including individual investors) will be able to trade eligible Hong Kong-listed stocks directly. My sense is that even if the police take down barricades, the protesters won’t leave. There have already been attempts to clear out Mong Kok, but as we saw, people just retook the streets. Even though the police have been permitted to arrest anyone who obstructs the clearing of the barricades, I highly doubt they have the capacity to arrest all the thousands of people who have come out again and again to re-pack the streets when they felt their movement was being threatened. But we’ll see. In an interview with the Wall Street Journal, Hong Kong Chief Executive CY Leung said horrible things that reflect on how the outrageous economic inequality in Hong Kong has its ties to politics. He warned that if candidates were nominated by the public, the population that earns less than the median monthly salary of US$1,800 could dominate the process. “If it’s entirely a numbers game and numeric representation, then obviously you’d be talking to the half of the people in Hong Kong who earn less than US$1,800 a month,” Mr. Leung said. This, of course, let off another burst of anger at CY. In essence, his words suggested the concern that because Hong Kong was successful due to its capitalist economy, if poor people were allowed to vote – and already 20 percent of Hong Kong’s population lives below the poverty line – then they would dominate politics and force the passage of policies for the poor. Here’s a snapshot into Twitter responses. A video on Facebook was re-shared from January 2014, showing a CY Leung mock-Mario style game. People also shared clips of his election campaign where he promised to work for the poor, now mocking his hypocrisy. That night, during the student-government talks, the HKFS representatives pulled out CY Leung’s words on the government representatives. Alex Chow: Are those with 14k HKD monthly salary or under 2nd class citizens? CY Leung also did an interview with ATV Newsline on October 19 in which he hinted at foreign influences in the protests and sort of dissed Mong Kok. That night I joined the crowd watching the student-government talks in Admiralty. 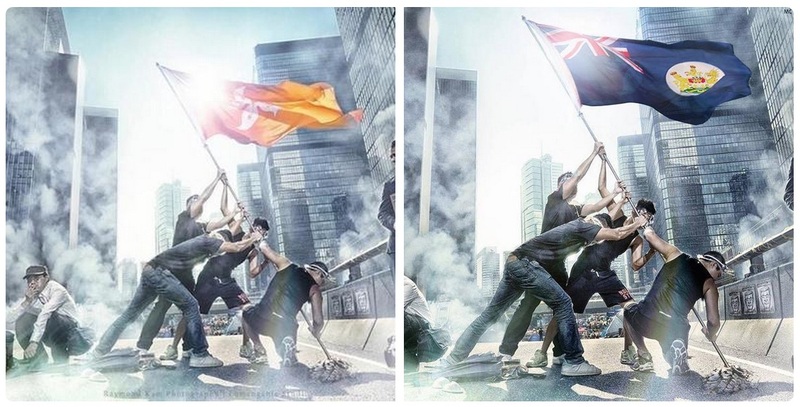 A photo of Hong Kong protesters appears in imitation of the classic Iwo Jima pose. I’m not sure what I think about it – its borrowing of American soldiers fighting the Japanese, the layers of meaning placed on top of this image and now being treated in a new way – and I’m not sure what I think about the artist’s statement, either. Nor am I sure what I think about the new version of it. This interview with Sean Starrs, Assistant Professor of International Relations at City University, is interesting, though I don’t know much about the website it’s posted on. The two biggest events of the day, for me: (1) Hundreds of people angry at CY Leung’s remarks marched up to the Government House in protest. (2) The EMs share a video, taken by Passion Times, of what looks like a South Asian man using box cutters to jab at a protester in the abdomen. You can see a photo of his face at the bottom of this SCMP recap of the day. He was apparently part of a group of anti-Occupy men trying to take down the barricades in Mong Kok, though the EMs – many of whom know and/or recognize him – immediately cast doubts on his true intentions and on his past deeds. Later that night, a man also tried to set one of the Mong Kok supply stations on fire, but was prevented from doing so by the protesters at the scene. Someone threw down a bag of what seemed to be feces and oil as well. Luckily, despite the havoc, the shrines managed to stay up. The next evening SCMP also reported that the police were looking for both the South Asian man and his victim. As late as November 6, however, nothing has come of the incident legally. Epoch Times also shared a new meme of Hong Kong lawmaker Lau Kong-wah. Lau was at the student-government talks but he, along with Edward Yau, did not say a single word the entire time (while every one of the five students spoke extensively). Lau is also known as Mr. Rubbish Bin. 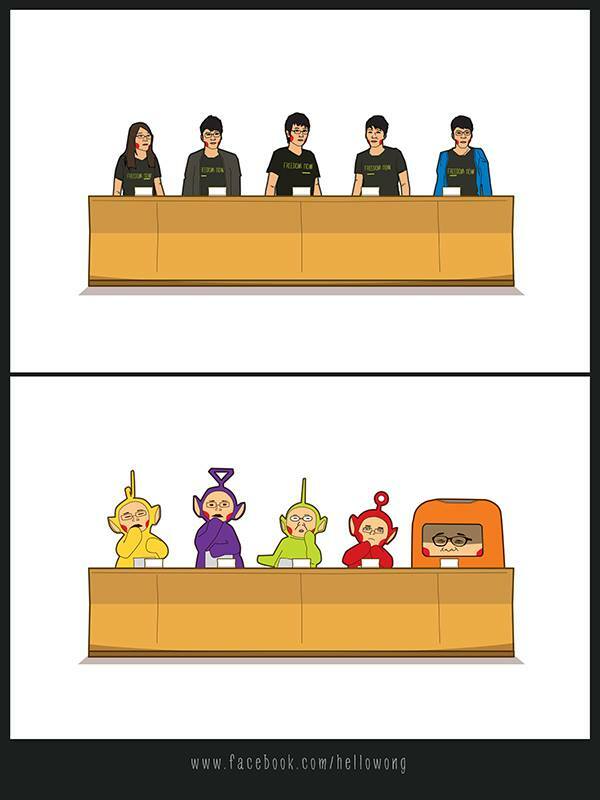 SCMP reported on more online memes mocking both Yau and Lau. Kenny G, famed saxophone player (especially well-known in China), visited Admiralty, posted photos of himself on Twitter, got criticized by China, and promptly recanted any support for the protests. He thus became yet another bad joke in the Movement, more fodder for the meme machine. SCMP also reported that some police officers and their family members have begun receiving personal threats. I don’t think this is okay. It’s not their fault that society is upset; they’re just doing their job! And as if to emphasize that not all government and police workers are evil, here’s this Facebook page where Hong Kong civil servants who support the Umbrella Movement have been posting their messages of encouragement. 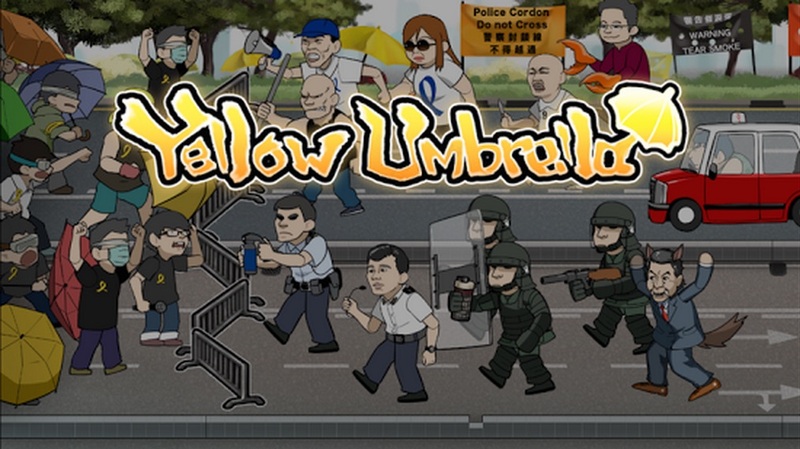 Umbrella Movement landmarks appeared on Google Maps – which I love. 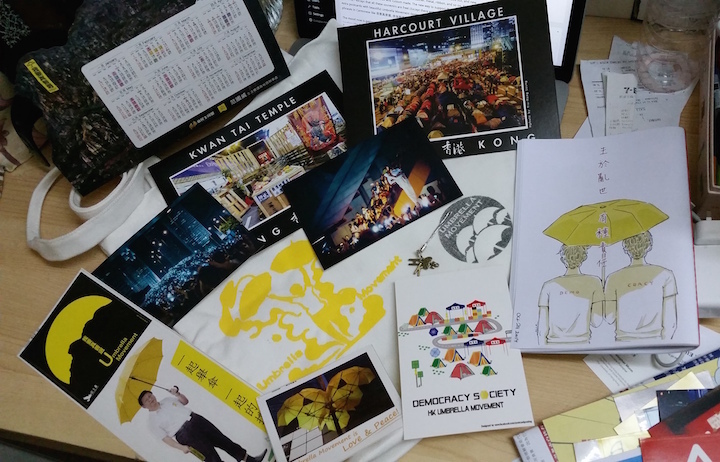 It really marks another way that Hong Kong protesters are claiming the city and its streets for themselves, not just physically redesigning and repurposing spaces, but also remaking the way it appears in digital space as well. Unfortunately, the landmarks were removed pretty quickly from Google. In general, it’s been difficult to figure out ways to save and/or archive all the art, as this SCMP article discusses. The video of the South Asian man finally went mainstream, though I feel that the reporting could be described as somewhat racialized. By calling the man “wild-eyed,” it makes it sound as though he’s rather animalistic – something that ethnic Chinese anti-Occupy “thugs” haven’t been associated with. It was definitely one of those days when the mood online and on the protest sites was pretty jubilant. To wake up and find a huge banner proclaiming “I want true universal suffrage” on top of a mountain – and this isn’t just any old mountain, but the Lion Rock of the famous TV show and song, which gave rise to the saying 獅子山下精神 (Spirit under the Lion Rock) that has marked a core part of Hong Kong’s identity – as one of the Hong Kong Studies professors at HKU said, this was the moment in which the Umbrella Movement redefined what Hong Kong and the Spirit under the Lion Rock really was. The group also released a second video here. Police went up to the Rock to investigate, but the banner stayed up, high above the city, throughout the night. People began photoshopping the Lion Rock banner on people’s foreheads and also putting it on their own foreheads. I had no idea what this was about at first – until someone explained to me that this was what you do to stop a Chinese zombie! More details on this fascinating and awesome discovery later. It seems that I am unable to both update my blog and go to sleep at a normal time. I heard news that the Occupy Central organizers would hold a vote that coming Sunday. The topic was rumored to be whether to continue the occupation of the streets or not, but this was later revealed to be false.